When you have a busy lifestyle, nothing is more beneficial than a full body workout routine. For this reason, we've put together a list of some simple exercises that can help you transform your body in just ten minutes a day. Now, all you have to do is stick to it. The plank is one of the most fundamental exercises to do regularly as it helps tighten and strengthen your core, leading to increased overall strength and stability. Perform the exercise as shown above, propping yourself up on your forearms and feet and keeping your back perfectly straight. Keep your core tight and hold for intervals between 10 seconds and a full minute, depending on your fitness. This is the granddaddy of upper-body strength training. The push-up has been around pretty much forever, and is a great way to build up your chest, shoulders, and triceps (plus your core). 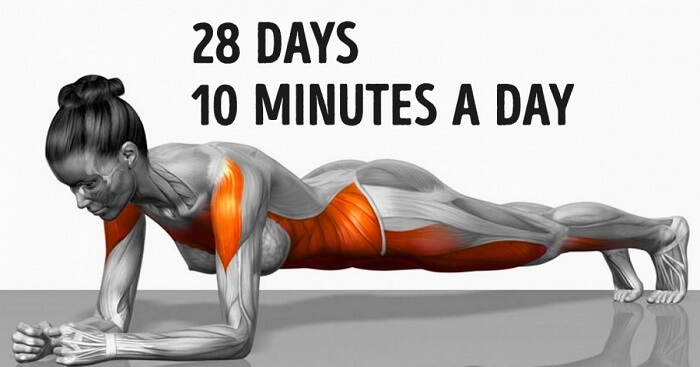 Start in a plank, then bring your body down, before pressing back up. Keep your body straight throughout. This yoga-inspired exercise is perfect for toning your thighs and glutes. Start on all fours as seen in the photo, then extend one leg and the opposite arm straight out in front of you. Repeat on the other side. Just as push-ups are the essential upper body exercise, squats are the ultimate lower body move. Place your feet shoulder-width apart and then start squatting down/back as if you were going to sit in an imaginary chair. Keep your back straight, and extend your arms outwards for balance if needed. Then, slowly raise yourself back up. Lie flat on your back, raise one leg and bend at the knee, then touch your hand to your knee. Repeat on the other side. First get into a triangular position with your body, keeping your back and your legs in straight lines to create a "V." Then, raise one leg to the air as seen in the photo, then slowly bring it in towards your chest. Try to touch your nose to your kneecap. Return to the starting position and repeat with the opposite leg. Start with your legs set apart wide, and knees slightly bent. Prop yourself up against a wall. Then, lace your hands together or grab a medicine ball (seen above) and twist your body side-to-side, trying to touch the wall with your hands/the ball. So, now that you know the moves, here's how to put them all together into a four-week plan. Rest for 10 seconds between the exercises. Alternate the following sets for six days. Week 3: Repeat Week 1 exercises. Week 4: Repeat Week 2 sets.